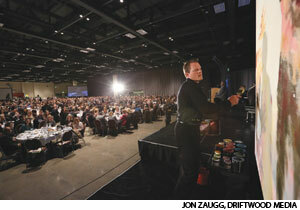 Paul Oman paints an original acrylic during the Feed My Starving Children Gala at the Minneapolis Convention Center in November 2014 while gospel singer Robert Robinson performs. Some pastors can paint a vivid picture with their words. For Paul Oman it’s the opposite. It’s his pictures that speak volumes. 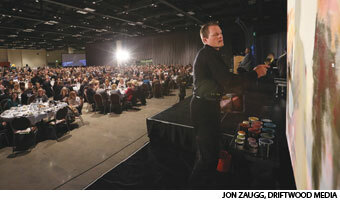 The ELCA pastor discovered he could reach people more effectively by painting his message during a worship service. Oman’s ministry, which began as a one-time experiment in 2006, became so successful that he resigned his call to operate “Drawn to the Word: Bringing the Word of God to Life Before Your Eyes” (www.paulomanfineart.com). “My hope and prayer is that, through the medium of the creative artistic process, the Holy Spirit will bring the promise of God through Jesus to life in the hearts and lives of all who see and hear it,” Oman said. His first artistic attempt occurred during a Good Friday service at Trinity Lutheran Church, Birchwood, Wis., where he served. 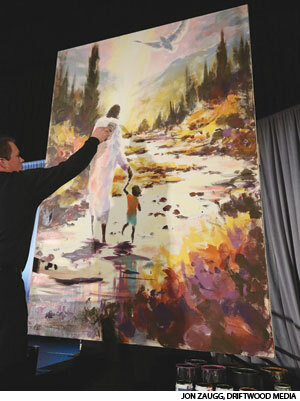 “The town has about 500 people, and there were maybe 40 people in attendance, so I figured it was pretty safe to try my idea of painting the sermon instead of preaching it verbally,” Oman said. The service included music and singing, while a retired pastor narrated the story of Barabbas, who was freed from crucifixion instead of Jesus. During the narration and music, Oman painted an angry centurion with Jesus’ crucifixion taking place behind him. When he stepped back from his finished canvas, Oman recognized the impact the event had on the worshipers. The next year, more than 200 people attended, and then 300, and it continued to expand. The painting, completed in 55 minutes, was auctioned to provide meals for people in need. Oman now receives calls weekly asking him to paint at a congregation, spanning a variety of denominations. He works closely with clients and encourages a multifaceted event. “The event host chooses a theme, which can be a specific biblical story or a general theme, like light and darkness, or water of life,” he said. After the theme is chosen he listens to the hosts and tries to incorporate elements specific to the congregation into his painting. He spends time planning the painting, and sometimes creates a small mock-up. The finished canvas is hung at the congregation, where it continues to inspire those who see it.